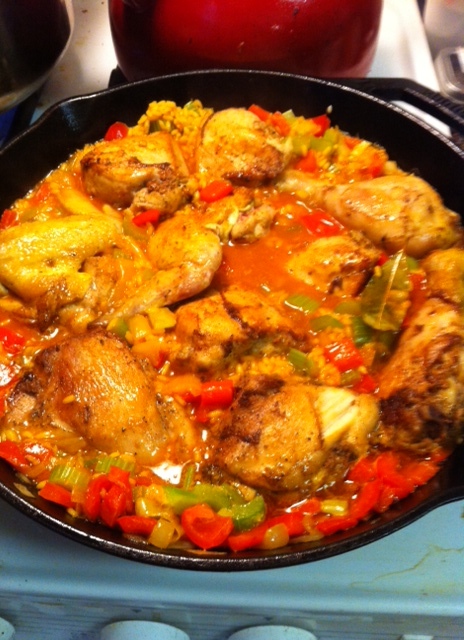 I have been craving some serious arroz con pollo for a little while now. NOT your average boring rice with chicken, cause this dish is chock full of goodness. Celery, onion, pepper, olives, tomato, capers, corn. And a little GOYA sazon as a cheat. This is pretty hearty for what’s quickly approaching summer in the city, but in my mind it’s so good that you can have it whenever you want. 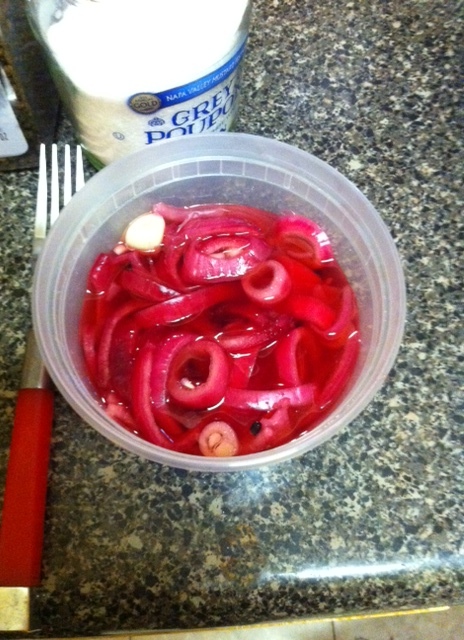 To brighten it up though, I topped it with my favorite condiment- pickled red onions. Some vinegary brightness makes this work for hot weather, and while you can buy pickled red onions, they’re also easy to make! So here’s two recipes for the price of one. Wassssup. 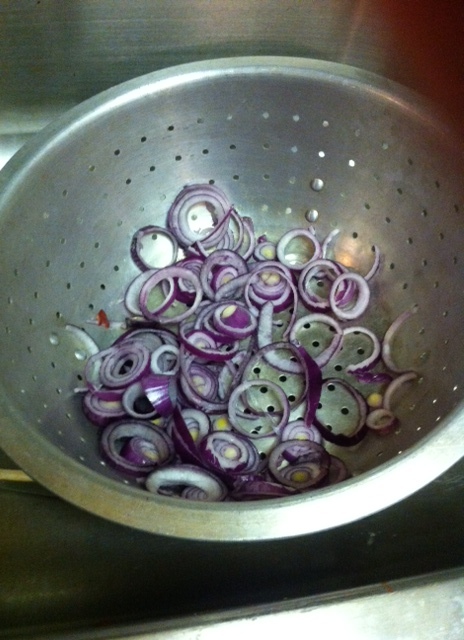 Place sliced onions in a colander, and bring 4 cups of water to a rapid boil. Once boiling, slowly pour over the onions, almost as if blanching them. This will soften them a bit and help them start to break down slightly. While water is coming to a boil, mix together all remaining ingredients in a heavy plastic container, or glass. Don’t use metal! The vinegar will react with many metal containers due to a chemical reaction between aluminum and acids. Some people advise just glass (if you want a true, long lasting pickle then yes, use glass to seal it properly), but if you’re going to use it within a week or two, you don’t need to seal it. And in that case, plastic works just fine. Add the onions to the vinegar mix, and let sit for at least 1/2 an hour to get the best flavor. If you have the desire to cut up a whole chicken, it is by far the most cost effective way to this meal- I did an 8 piece cut. 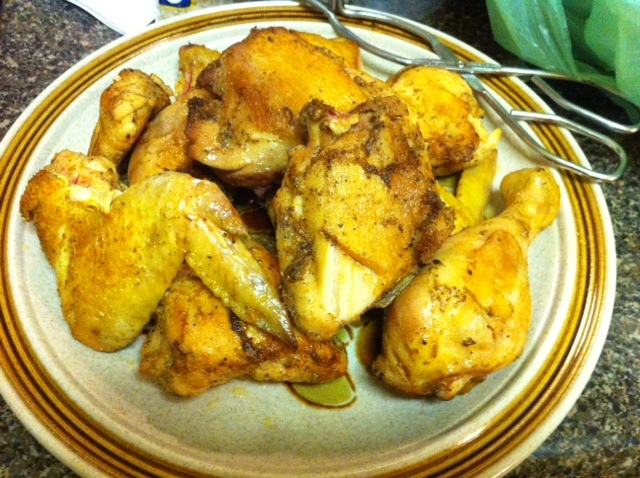 If you don’t have the time or energy, I totally understand…just use thighs! Season them with salt, pepper, paprika, and cumin, then cook in a deep skillet with about 2 tablespoons olive oil.Cook on medium heat about 6 min/side, then remove to a plate. Leaving the chicken bits in the pan, cook the onion for a few minutes until soft and becoming translucent. Scrape the bottom, add the garlic and rice, and cook for 1-2 minutes, stirring to prevent the rice burning. 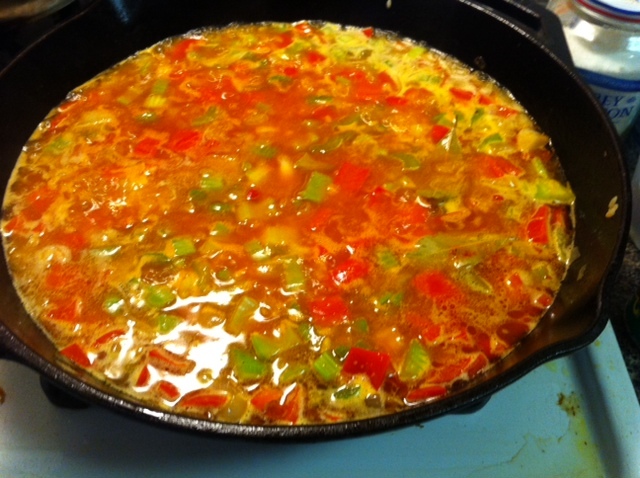 Add celery, pepper, tomato paste, bay leaves, goya sazon, stock, and wine or water, and stir to combine. Bring the mix to a boil on medium heat, stir, then add the chicken. Lower heat to very low, cover the skillet, and let cook for 20 minutes. Depending on the size/heat of your pan, you may need to add up to 1 cup of water at this point if the mixture looks dry. Cover again and let cook additional 10 minutes, until rice is soft. Top with the tomato, corn, capers, olives, and PICKLED RED ONION!! Nom nom away. And cause it’s so full of veggies and yet so delicious…..